How Can I Catch Bass On Lake Russell in Georgia? If your idea of ideal summer bass fishing is rocking and rolling in the wakes of off shore yachts and ski boats while listening to the incessant buzz of mosquito like jet skis, Lake Russell is not for you. At Russell you are likely to see more bass boats than jet skis and fishermen usually outnumber water skiers on a summer day. Lake Russell is located between the Lake Hartwell dam and the upper end of Clark’s Hill on the Savannah River. It reached full pool in 1984 and its 26,650 acres of water cover parts of Georgia and South Carolina. You can fish the whole lake with a license from either state and there is a ten bass daily limit. When the Corps of Engineers built lake Russell much of the timber was left standing. There are many coves and creeks where the timber sticks out of the water and more areas where it is below the surface. The channel is marked by telephone poles set on the ends of points and these poles show the extent of the shallow water near the channels. One of the most outstanding characteristics of Lake Russell is its natural shoreline. Development is restricted so there are no houses or docks on the lake. There are two state parks with camping, several boat ramps and a marina, but most of the shoreline is still in its natural wooded state. This is pretty, but it also means access is limited and fewer boats are on the water. Since Russell is a Corps of Engineers lake, biologists from the state and the Corps work together to monitor fish populations and habitat. Bubba Mauldin is the Georgia fisheries biologist responsible for the lake, and he says bass are healthy and the habitat seems to be improving. Russell is a pumpback lake and there was some early problems with oxygen levels, but an aerating system to inject oxygen into the water near the dam helps both Clarks Hill and Russell. This year the turbines at Hartwell are being renovated and will have a venting system to put some air into the water as they operate, giving even more oxygen content to the waters of Lake Russell. In the early years Russell was a largemouth lake since spotted bass are not native to the Savannah River system. Fishermen took it on themselves to start a “midnight socking” program and now spots make up about half the population in numbers of bass in the lake. This has not been a problem so far but the long term implications are not clear. Blueback herring have also had a tremendous growth in Russell and provide abundant forage fish for the bass. Both Bubba and the Corps biologist Jamie Sykes say Russell should not have the problems herring have caused in some north Georgia lakes. The herring do make both largemouth and spotted bass at Russell more open water fish. 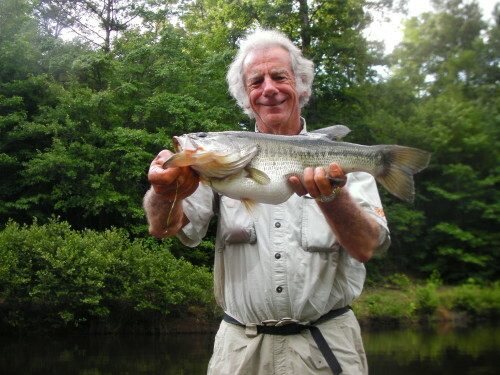 The Georgia Bass Chapter Federation Creel Census Report compiled by Dr. Carl Quertermus at University of West Georgia shows the increase in spotted bass. In 1994 spots made up only 3.4 percent of the bass weighed in during club tournaments. By 2004 that had increased to 36.2 percent spots. Since largemouth usually outweigh spots these numbers are probably skewed because tournament fishermen tend to cull spots and keep largemouth. This creel census reports also touches on the problem spots can cause. Spots are smaller and more aggressive than largemouth, to they tend to dominate suitable habitat, taking the place of bigger largemouth. The average big bass in a club tournament in 1994 was 4.51 pounds but in 2004 it was down to 3.33 pounds. Jamie says he sees fewer big bass but does not know if that is from the spots increasing or other changes in the lake. “Much of Russell is good spotted bass habitat,” Bubba told me. The main lake on the Savannah River is where the spots concentrate and the creeks tend to hold more of the largemouth. Both species are fat and healthy so the environment is good for them, but the spotted bass population seems to be slowly increasing. Jamie not only studies the bass at Russell, he likes to fish for them, too. He says June is a transition month and there are three good patterns he likes to follow. Early in the month he looks for bass holding around riprap, feeding on the tail end of the herring spawn. For the first week of June fishing topwater plugs and soft jerkbaits around the bridges can offer fast action. The largemouth are also pulling out of the coves and creeks headed to their deeper summer holes and Jamie likes to catch them in June. He will follow a channel in the standing timber that comes near and above the surface, keeping his boat in the deepest water in the area. You can follow the channel with a depthfinder but also watch for the biggest trees. They usually mark the old channel. To catch the largemouth on this pattern Jamie rigs a Zoom Finesse worm with a 1/8th ounce sinker on 10 pound test line. He will cast it to the trees and let it fall. If he sees the line move it is time to set the hook, and if the worm falls for five to ten feet without a bite he tightens up his line. If there is a fish there he sets the hook hard, if not he reels in for another cast. Although the tree may be standing in 40 feet of water Jamie expects the largemouth to be holding from three to ten feet deep. He says you need a stiff rod to horse the fish from the timber, even with the light line. “If you use a limber rod you are going to have a long day,” Jamie said. You will lose a lot of fish to the cover if you can’t move them away from it. Jamie catches mostly largemouth on this pattern. As the water gets hotter toward the end of the month Jamie says to fish “poles and points.” The poles marking the ends of the points on the main channels have brush and rocks on many of them and they are easy to locate. This is a community pattern but it works. That is why it is a community pattern. Find a pole and cast all around it with a Texas or Carolina rigged worm or a big crankbait. You are looking for cover that the bass will hold in waiting on herring to pass by. If there is some current the bass will feed even better. Bobby Stanfill lives near Russell and fishes many tournaments there. Over the years he has had a lot of success in them and fishes the lake a lot. He offers another way to catch bass there and to beat the heat of June. Bobby likes to fish at night. Since there are no lights on the shoreline Russell can be a very dark lake at night. Bobby knows it well but if you are going for the first time, a good GPS will help you get around in the dark. Just remember the GPS will not show you timber and floating logs. Bobby will find long main lake points and humps with brush or rocks down 15 to 25 feet deep and fish them with three baits. He says the bass hold in the standing timber off these points and run in to the bottom to feed, so he always looks for points with trees near them. The trees may be down 20 feet but the bass use them. Late in the day Bobby will bounce a spinnerbait through the limbs of the trees for the bass holding there and work it on the bottom in brush, too. He likes a heavy spinnerbait with small blades so it will drop fast and can be worked deep. He modifies his baits to suit his needs, and likes white skirts and silver blades. A big crankbait can also be fished through the trees and across the bottom. It needs to get down at least 15 feet deep to reach the feeding area of the bass, so you need fairly light line and you must make long casts. Shad colored crankbaits work well for this kind of fishing. A worm rigged either Texas or Carolina style is the other bait Bobby fishes. He likes a big worm like the Zoom Ol Monster or an eight inch lizard and the color doesn’t matter after dark. Drag the worm through deep brush, stumps and rocks and you should catch both spots and largemouth. Lake Russell is a great choice for a June bass fishing trip. It will be pretty and not as crowded as other lakes, and the spots and largemouth will cooperate. Go during the day or at night and try these patterns. You should catch good numbers of bass. This entry was posted in Bass Fishing, Where To Fish on September 30, 2013 by ronniegarrison. Editor’s Note: Today’s feature is courtesy of Texas A&M University-Corpus Christi. CORPUS CHRISTI, TEXAS- About 1,500 marine fishes make the Gulf of Mexico their home. From birds, to fish, and marine mammals to crustaceans, the Gulf of Mexico Species Interaction database (gomexsi.tamucc.edu, created by a researcher at Texas A&M University-Corpus Christi, currently has diet data on over 600 of the marine fishes. It is the first and only database of its kind for the Gulf of Mexico that shows how the cataloged animals interact with each other in the food web. Simons started collecting data on how the different species of the Gulf interact in 1987, but it wasn’t until 2002 that he got the idea to put all of the information he had collected into one, easily-accessible place: the worldwide web. The scope of data in GoMexSI (gomexsi.tamucc.edu) includes the estuaries and coastal waters of Cuba, Mexico, and the United States and all of the Gulf waters to the deepest realms. Simons says the database has already proven valuable to various research projects including the National Oceanic and Atmospheric Administration’s Integrated Ecosystem Assessment program that is using the data for diet information on fish that will aid in the construction of fishery ecosystem models. The effort has also enabled the detection of data gaps that will help to direct future data gathering efforts. Recently the data were used for a Gulf of Mexico Alliance project that seeks to understand the movement of mercury through Gulf food webs. The data that Simons has collected was used to construct food webs for the king mackerel in six locations around the Gulf. Dr. James Simons “if you’re a fisherman, you would probably like to know what type of critters your favorite game fish likes to eat.” Photo from Texas A&M – Corpus Christi. Simons also hopes to work with the Texas State Aquarium to develop a GoMexSI app that would show people, at any given display, where the fish they are seeing fit in the food web. The GoMexSI project already has over 45,000 digital records of species interactions, and Simons hopes that is just the beginning. The data comes from a wide variety of sources including abstracts, contributed datasets, proceedings, unpublished manuscripts, peer-reviewed literature, theses, and government reports. Simons and his team are currently extracting and standardizing the data to make it easier to explore and use. This entry was posted in Fishing Information, Saltwater Fishing on September 29, 2013 by ronniegarrison. When poet Sidney Lanier wrote those words in “The Song of the Chattahoochee” little did he know the future of his river and the fantastic bass fishing lakes that would be built on it. Four of the most famous bass fishing lakes in the US are on the Chattahoochee River, and the middle two offer you some incredible opportunities this month. Lakes West Point and Walter F. George, usually called Lake Eufaula, have some bass fishing characteristics in common but differ in many ways. Knowing those similarities and differences, and how to take advantage of them, can help you catch bass on both in May. Although the upper end of Walter F. George is only a few miles from the West Point dam, the terrain changes dramatically from one to the other. West Point dam is near the fall line in Georgia. Above the fall line are rolling clay hills and valleys. Below it the land flattens out in sandy plains. This change makes the lakes very different. West Point has more coves, pockets and cuts on it. The hills mean the water drops off quickly near the bank in most areas and the contour lines are usually close together. At Walter F. George huge flats line the banks and there are few coves and pockets on the main lake. Channels tend to wind through flats with shallow water on both sides. A contour map shows wide separation in the lines reflecting these big flats. Both lakes are fairly fertile with West Point receiving a lot of rich effluent from Atlanta. What fertility is soaked up from the upper reaches of West Point to the upper end of Walter F. George is added back by discharges from Columbus and runoff from farms, so Walter F. George remains well fertilized. This means bass grow fast and fat from eating the large numbers of forage fish in both lakes. West Point tends to have water that is a little more clear than Walter F. George, and the shoreline has more natural rocks. Although both lakes have populations of spotted bass, they have not taken off at Walter F. George like they have at West Point. Spots like to spawn on rocks in deeper water, so West Point is more suited for them. The changing population of spots is reflected in the Georgia Bass Chapter Federation Creel Census Report compiled by Dr. Carl Quertermus at the University of West Georgia. In 1994 93.04 percent of the bass weighed in during club tournaments at Walter F. George were largemouth. Ten years later in 2004 88.7 percent were largemouth, less than a five percent change. At West Point in 1994, 90.17 percent of the bass weighed in were largemouth. That dropped to 39.1 percent in 2004, more than 50 percent less. That is a huge change in the population of bass in the lake in only 10 years. The size limits on both lakes has changed over the years but both lakes have had similar rules. For several years on both lakes largemouth had to be 16 inches to be kept, now the size limit on both lakes is 14 inches for largemouth. Spotted bass have no size limit in either lake, but most clubs require spots to be at least 12 inches long to be weighed in during tournaments. Georgia and Alabama share both lakes, and rules have been adopted to make size limits and other laws similar. Both states have the same size limits and you can fish anywhere on both lakes with a Georgia license. You can fish all of Walter F. George with an Alabama license but are restricted to areas below the Highway 109 bridge over the Chattahoochee River at West Point. Current plays a part in bass fishing on both lakes but is more important on Walter F. George. Since Walter F. George is a flatter, more shallow lake power generation at the dam produces a strong current and bass react to it by feeding on river and creek ledges. On West Point there is a good current at times and bass will feed better on main lake points when the water is moving. You are not likely to see alligators on West Point but you can’t avoid them at Walter F. George. They really don’t affect the bass fishing but they can mess with your mind until you get used to them. Leave them alone and they will not bother you, in fact they will usually try to get under water and away from you as soon as you get in their area. By the beginning of May most bass have finished spawning at both Walter F. George and West Point. They have started their movements toward main lake summer structures on both lakes. The ways to find and catch bass are similar in some ways but differ in others. Ronnie agreed to share some of his tactics for fishing both Walter F. George and West Point. He usually approaches both lakes with a tournament perspective, hoping to catch a limit of quality fish rather than catching a lot of smaller bass, but he has some tips for catching numbers as well as big bass, too. Most of the bass at Walter F. George have finished spawning by early May and are feeding up recovering from the spawn. They are starting to move toward their summer holes out on the deep main lake ledges, but some changes over the past few years has slowed that migration, making May fishing even better and more exciting. Hydrilla got started in Walter F. George a few years ago and now covers enough of the lake to be a significant bass pattern. Couple the newer hydrilla with the water plants that have always been at Walter F. George and you have perfect ingredients for a great shallow water bite in May. Ronnie has been taking advantage of this shallow bite for the past two years. Ronnie usually fishes the middle section of Walter F. George in May, working from Cowikee Creek down to the Barbour Creek area. He looks for hydrilla or “river grass” growing in two to four feet of water, and works it with a variety of baits. Buzzbaits and spinnerbaits are good, especially if you can find some shad still spawning. Both baits can be worked over the grass drawing strikes. 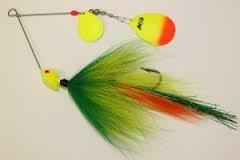 Most days Ronnie’s main lure is the Paca Craw, a hollow bodied soft plastic crawfish made by NetBait. This versatile bait can be fished on top like a buzz bait, you can swim it over the grass or you can drop it and fish it like a Texas rigged worm. Ronnie Texas rigs the Paca Craw in 15 pound Big Game Trilene line, a 1/8 to 1/4 ounce sinker depending on wind and depth, and a 3/0 hook. Find a grassbed and start by fishing the Paca Craw over the top. The craws on the bait will flap and buzz, churning the water when you keep it on top. When the bait gets to the edge of the grass, let if drop and keep your line tight. Strikes usually come on the fall. If nothing hits, hop it a couple of times then swim it back to the boat for another cast. An excellent area to try this technique is the Alabama shoreline from the mouth of Cowikee Creek down to Old Town Creek Park. This huge flat is covered in grass beds and is a good spawning area, so the bass are still here from the spawn. They will move to the grass to feed before moving deeper later. Some bass will move on out on the ledges early in May and you can fish them all month, being ready when the majority of bass move out during May. This is classic ledge fishing at Walter F. George and you can catch bass on crankbaits and Carolina rigs all month long. Ronnie likes a crankbait that will run about 10 feet deep and uses Trick and Finesse worms on his Carolina rigs. He looks for ledges toward the shoreline that are eight feet deep or so on top. Fish both crankbaits and Carolina rigs on these spots, and if stumps or brush is there it is even better. There are some good ledges right where Cowikee Creek hits the main river as well as in the creek up to Lake Point State Park. There are even more good spots below the two causeways and the ones down to the mouth of Barbour Creek are some of Ronnie’s favorites. Ronnie likes to fish the first drop on these ledges. A good lake map will help you find places to fish. Look for a bend in the creek or river channel toward the bank where the top of the ledge is less than 10 feet deep. Start in deep water casting up onto the ledge and fishing your bait back. Fish with the current if it is moving. You will catch some spotted bass on Walter F. George on the ledges but they are usually not the bass you want in tournaments. To have some fun, find some rocks or brush on the ledges and throw your Carolina rig. When you catch one spot you are likely to catch several since they tend to school up and stay deeper in May. The first point between Cowikee Creek and the river, on your right as you go out of the creek, is a good spot for spots. The creek channel swings in close on one side and the river channel is close on the others side of it. Fish it from both sides casting across it. When current is moving across this point and ledge fish your bait with the current and you should catch a bunch of spots. On West Point Ronnie usually stays back in the smaller feeder creeks off the main lake from just above Highland Marina down to Wehadkee Creek. These creeks are excellent spawning areas and have deep enough water to hold bass all during May. He looks for cover along the outside bends of the creek channel and any points in the creek. After spawning bass will move to cover in the 10 foot range and feed, holding there until the water gets too warm for them to stay. They take advantage of shad and other baitfish in the creeks as well as crawfish they find there. The key is to find some kind of cover on structure that will give the bass a good ambush point. Bass at West Point seem to love a buzz bait and Ronnie will fish one over creek cover. He usually finds bass holding about half way back in the creeks and runs in part way before starting to fish. You can move fast and cover a lot of water with a buzz bait as you work into the creek. The Paca Craw is also a favorite bait at West Point. Ronnie will fish it like a buzz bait all the way back to the boat if the fish are active. If they don’t hit it on top, he will cast it to the bank, buzz it a few feet to draw attention, then let if fall to the bottom. He can then fish it back to the boat along the bottom, hitting any stumps, rocks or brush there. 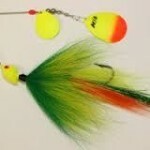 Every move of the Paca Craw will cause its craws to wave and move. You can either hop it and let if fall back or swim it along right on the bottom. Either way the bass seem to like it. If there is cover, hop it. If the bottom is fairly smooth, swim it along just over the bottom. A jig and pig is also a good bait if the bass are holding tight in brush. It comes through thick cover better than the craw and Ronnie had real good luck with a jig and pig last May in the creeks off the river just upstream of the mouth of Yellowjacket Creek. He would pitch the jig and pig to the brush or blowdowns and work it slowly through them. Toward the end of May largemouth start moving out to the main lake. Look for points with a drop on them in 10 feet of water and fish a crankbait or Carolina rig across it. Any drop on the point will hold fish. Some of the best are not real obvious, a one foot drop can be over looked by fishermen but the bass will use it. Fish with the current if it is moving. This is a good time for big baits at West Point. Use big crankbaits like a DD22N, Fat Free Shad or Mann’s 20 Plus. Make them dig the bottom, stirring up silt as they bump along. Try big worms like a Zoom Ol Monster on a Carolina rig for bigger largemouth, too. Spots on West Point tend to bed in deeper water where there is rock and gravel and don’t usually move as far back into the creeks. Find a gravel or rock point near the mouth of a feeder creek and drag a Carolina rigged Finesse or Trick worm along it. A brush pile concentrates the bass. Rake the point from all angles and you should catch some spots up to about three pounds. You are likely to catch several spots in one place. Many tournament anglers try for a limit of spots first and then go after a kicker largemouth. Try the points at the mouths of creeks below the Highway 109 bridge as well as marked shoals in that area for spots. Current really turns the spots on so head to them if water is moving. Fish with the current for best results. Ronnie fishes lighter line at West Point since the water is more clear and there is less cover to hang up on. He throws his Paca Craw on eight to 12 pound test Big Game line and but goes to heavier line when pitching a jig and pig to thick cover. Both West Point and Walter F. George are excellent lakes to fish this month. You can catch bass fairly shallow on both and the bass are hungry right after the spawn. Pick the lake you want to fish, try Ronnie’s favorite baits in the mid lake areas on both, and you should have a good catch. This entry was posted in Bass Fishing, How To, Where To Fish on September 28, 2013 by ronniegarrison. Today’s feature on restoration of California’s Morro Bay eelgrass comes to us courtesy of N.O.A.A. Morro Bay is a small fishing port situated halfway between San Francisco and Los Angeles on California’s Central Coast. The town is often referred to as the “Gibraltar of the Pacific” because of a volcanic peak that rises nearly 600 feet above the harbor. It is an iconic coastal village closely connected to the sea and the environment that sustains it. So it was no surprise when local community members, as well as state and federal agencies, responded to a request from the Morro Bay National Estuary Program to help restore the bay’s rapidly declining eelgrass beds. The exact cause of the decline is unknown, but since the 1850s, eelgrass beds along California’s entire coastline may have declined by as much as 90 percent. Human stressors, such as dredging, nutrient pollution, and sedimentation, are possible causes. However, warming temperatures may also be diminishing the plants’ overall ability to survive. In Morro Bay eel grass is essential to halibut, juvenile rockfish, leopard sharks, pipefish, and numerous other fish and crustaceans. It also provides habitat for sea birds. Black Brant, for instance, use Morro Bay as one of a few migratory feeding grounds between Alaska and Baja California. Eelgrass also supports the marine environment by converting sunlight into oxygen. Some studies indicate eelgrass beds may also be capable of absorbing carbon dioxide, an atmospheric gas linked to climate change that can negatively impact the health of our oceans and marine life. 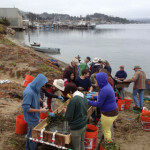 With all of this at stake, it’s no wonder volunteers of all ages and organizations gathered along the shore of Morro Bay to harvest, prepare, and transplant eelgrass back into the upper reaches of the waterway where it has significantly declined. 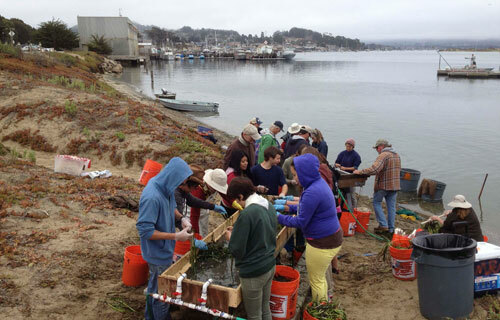 The restoration process for eelgrass is labor intensive, and this effort was no exception. First divers harvested no more than ten percent from a healthy eelgrass bed and brought it to shore. This entry was posted in Saltwater Fishing on September 27, 2013 by ronniegarrison. Where Can I Catch Bass In Georgia? Georgia waters produced the world record largemouth bass. No other state can make that claim. Beyond the world record, Georgia is one of the most diverse states for bass fishing. From shallow swamps and oxbows in the south that contain huge largemouth to lakes in the mountains that have populations of smallmouth, we have it all. You can fish ponds, lakes, streams, rivers and even brackish tidal waters for bass. In Georgia you can fish for largemouth, smallmouth, spotted, shoal, Swanee and redeye bass, six of the seven recognized kinds of black bass. No other state has that many different kinds of black bass. And there is a new bass here, found on the Broad River at Clark’s Hill and called the Bartram’s bass, that may be recognized as a new distinct subspecies. Bass fishing in Georgia is amazingly consistent over the years. Each Georgia Bass Chapter Federation club in the state sends in a “Creel Census Report” (CCR)to Dr. Carl Quertermus at the University of West Georgia after each tournament, and he keeps records on a variety of information. These records go back 27 years and show the catch rate during tournaments has changed very little over all that time. Over the past few years more effort has been made to tailor creel and size limits to specific bodies of water. Some have worked well, like the 14 inch minimum size limit on all bass at Lanier. The population of spotted bass in that lake has responded by growing fast and fat on the blueback herring there. At Oconee, the slot limit has not really paid off because anglers don’t follow it. On that lake anglers are encouraged to keep bass from six to 11 inches long to reduce the numbers of small bass. Very few keep small bass, so a regulation that would help the lake is not effective because it is not used. At Rocky Mount PFA a slot size limit on Heath Lake requiring fishermen to release all bass from 14 to 21 inches long combined with keeping the lake closed except the first ten days of each month has created a trophy fish lake. Heath is probably one of your best bets for catching a trophy bass on any PFA. Bass anglers have become more savvy over the years about their resources. For a long time fishermen would put out brush piles to concentrate fish, making them easier to catch. Recently bass fishermen, especially club fishermen, have worked with the Department of Natural Resources fisheries biologists to improve habitat on lakes, a long term effort that does not pay immediate results in bigger catches, but will help the bass population. Rather then putting out brush only to concentrate fish, efforts are being made on many of our bigger lakes to improve shoreline cover for bass fry, increasing the numbers that survive. Deeper cover is also added, but it is put out to give the bass more ambush points and places to hide rather than just adding a good place to fish, although it does do that, too. Most bass fishermen think stocking bass in big lakes would help, but generally it makes no difference. One pair of bass can produce more little bass each year than would be stocked in an area, so stocking usually just wastes time and money. In some specific cases stocking bass does make a difference. In the Flint River below the Blackshear dam, water level changes during the spawn means shoal bass don’t have very successful reproduction. For about 20 years the DNR has been stocking fingerling shoal bass in that area. For the past five years stocked bass have been marked with a dye that puts an indicator on their bones so biologists can track them. Since those marked bass have reached cacheable size, they make up 30 to 50 percent of the catch on that part of the Flint River. An average of 40 percent of the cacheable bass in that area are stocked fish. Water level fluctuation as well as colder temperatures on the Chattahoochee River below the Lanier dam decimated the population of shoal bass on it. A stocking effort is currently underway to restore shoal bass to that river and may offer another fish for Atlanta area fishermen to catch. At Lake Nottely in north Georgia, the introduction of blueback herring as created a problem with largemouth bass. Not only do the herring eat the same food bass fry need in the spring, keeping them from surviving and growing, there is some indication the herring actually eat young bass. To counter this the DNR is stocking largemouth in the lake. “Midnight Stocking” by fishermen of non native species is a problem in many Georgia lakes and rivers. Blueback herring may offer a temporary boost to the bass population, but long term they may create severe problems. Putting spotted bass in a lake may offer more bass to catch, but it usually causes the population of largemouth to decrease. Fishermen putting non native species in lakes can lead to may future problems. There are many good places to bass fish in Georgia. Below are several that should produce good results for you this year. In the past Allatoona has been called “The Dead Sea” when it comes to bass fishing, but that perception is changing. Last year the Creel Census Report showed Allatoona tied with Lake Russell for the highest bass per man hour catch rate of any lake fished by clubs. The lake if full of spotted bass but most are relatively small. Allatoona is one of the lakes where the DNR is working with local groups and fishermen to add cover to the lake. One reason Allatoona is so hard to fish is the lack of cover, and bass needed more cover to improve numbers. Man made fish attractors are providing the cover and offering places for anglers to fish. In the early spring spotted bass can be found on most main lake rocky points and steep banks. You can catch them on small jig and pigs, jig head worms and crankbaits. Green pumpkin is an excellent choice for worms and jigs. Fish the steep rocky areas slowly, keeping contact with the bottom. For largemouth head up the Etowah River to the Little River area and fish any cover you see. Also watch your depthfinder for brushpiles in coves and on points. Fish them with crankbaits and a jig and pig, or a Texas rigged worm. This pattern also works well in the fall. During the summer, try fishing the man made PVC “brush” piles with Texas rigged worms. Most of this cover was placed in 25 to 30 feet of water and you can get a map from the DNR showing their locations. Fishing at night is also good. Hartwell is one of our bigger lakes and produces largemouth, spotted, and redeye bass. The average size of bass is good, with the CCR showing it having the third highest average winning weight in club tournaments. It also had the sixth highest bass per angler hour of any reported tournament sites. In the spring bass move into creeks and pockets on the main lake getting ready to spawn. Try spinnerbaits and crankbaits around shoreline cover from half way back to the very back ends of protected areas. As the water warms throw a Trick worm in those same areas. During the summer a fantastic topwater pattern develops on Hartwell. Go to any main lake shoal – shallow water near deep water often marked with a danger marker – and throw Sammys, Spooks, Flukes and other top water baits. Largemouth, spotted and redeye bass all move to these areas and feed on herring, and you will often see a half dozen bass following one you hook. This pattern holds from mid spring through the summer. In the fall bass will again move into the creeks and crankbaits are excellent. Fish Shadraps and other crankbaits along steep creek banks and throw a jig and pig to any wood cover you find. Jigging a spoon on main lake humps and points is good in the winter. You can catch all three kinds of bass by dropping a spoon to fish schooled up in 30 feet of water. Locate schools of baitfish and fish under them, or find the schools of bass on your depthfinder. The Savannah River from Augusta to the coast offers many miles of good bass fishing. In the CCR it showed the third highest catch of bass per man hour, after Allatoona and Russell, so it is as good as our best lakes for numbers of bass. And the bass are a good size with the river having the third highest weigh per angler hour, following only Russell and Seminole. Bass tend to hold around the mouths of creeks and oxbow lakes, taking advantage of any breaks in the current early in the spring. Cast a crankbait or jig and pig around trees in the water on the main river right at the mouths of creeks and also fish back into the creek a short distance, hitting the deeper banks. As the water warms the bass move into the creeks and sloughs to spawn. Most old oxbows and creeks will have a deeper bank with stumps and wood cover on it and a shallow bank with overhanging willow trees. Fish the deeper bank with a jig and pig and spinnerbaits up until the fish spawn. After the spawn throw a Trick worm under overhanging willows for some good bass fishing. This pattern holds up through the summer but the best catches are in May and June. During the summer many bass move back out onto the main river where you can catch them on crankbaits and Texas rigged worms in wood cover. In the fall look for bass on the main river and around creek mouths. They will be more active as the water cools and will hit faster moving baits like crankbaits and spinnerbaits. In the coldest months, slowly work a jig and pig through cover that breaks the current for sluggish bass holding there. Lake Oconee is one of the most popular bass fishing spots in Georgia, with the third highest number of tournaments held there. Right in the middle of the state, it produces good numbers of bass that are a respectable size. The catch rate per hour and weigh per hour is right in the middle of the range of all bass tournaments in the CCR. Oconee is the site of an effort by the DNR and local clubs like the Lake Oconee Bassmasters to improve shoreline habitat. The shore is lined with seawalls and docks in many areas. Seawalls tend to eliminate natural cover and reduce places for young bass to hide. The effort here is to plant native water grasses in the shallows and place wood cover for the young bass to hide in. In the early spring look for bass feeding around riprap banks and seawalls. A spinnerbait or crankbait will attract these fish. As the water warms they move into pockets to spawn and you can sight fish for bass on the beds here. All spring and into early summer throw a spinnerbait around any grass cover you find back in the pockets. On sunny days in the late spring and during the summer, pitch a jig and pig or Texas rigged Mag II worm under boat docks. Docks on deeper water are usually better during the summer, and main lake docks with current moving under them are best. In the fall docks continue to produce but bass are more active and crankbaits and spinnerbaits on riprap and seawalls again pays off. During the winter small crankbaits in the same areas will work, but fish them more slowly. Also try bridge pilings and riprap this time of year. The Flint River from the Lake Blackshear dam to south of Albany has some of the best shoal bass fishing you can find. No tournaments were reported on this river although some shoal bass are weighed in by people running way up the Flint from Lake Seminole. Access is limited and the best way to fish the river is to drift sections of it. Team up with other fishermen and use two vehicles. Leave one at the take out spot and drive upriver to put in. You need a shallow draft boat with a strong trolling motor to fish the shoals on the river. Shoal bass like shoals. You may find a few in deeper sections of the river or holding on wood cover, but look for swift water running over rocks for the best fishing. In the spring you have to watch for high water that makes the river very dangerous. Fish the shoals with small Texas rigged worms, small jig and pigs and little crankbaits. Work any eddies and riffles for bass holding waiting on food. Fish with the current to make your bait look natural. In the late spring through the summer when the water stabilizes topwater action can be fantastic. Use a Pop-R or buzzbait around shoals and you should catch some good sized bass. Five pound shoal bass are usually caught in this area on most trips, along with many more in the three to four pound range. Early morning and late afternoons are best for topwater action. Lake Eufaula as it is commonly called is a well known bass fishery and produces excellent catches of bass year round. The 14 inch size limit means lower numbers of bass are actually weighed in during tournaments since many 12 and 13 inch bass that would be brought to the scales on other lakes have to be released. The heaviest winning weight in tournaments reported is the highest in the state. In early spring look for big largemouth moving into shallow water to look for spawning beds. Bass will often be surprisingly shallow and a long way from the channel. Try spinnerbaits and a jig and pig around the grass edges for them. After the bass spawn they move out the flats to the edges of the creek and river channels. The ledge fishing at Eufaula is legendary, and big crankbaits and worms work well. The Ledgebuster Spinnerbait, a heavy spinnerbait designed to fish deep ledges, was developed here. Look for stumps and brush on river bends on the main lake. The bass stay on the ledges from last spring until the next spawning season, so follow them from shallow ledges to deeper ones then back shallow in the fall. Topwater around shallow grass, especially the hydrilla beds that are increasing fast, can be good year round, too. You can’t really go wrong no matter what water you pick to fish in Georgia. And fishing is good all year long. Head to the lake, river or pond closest to your house and enjoy the great Georgia fishing. This entry was posted in Bass Fishing, Where To Fish on September 26, 2013 by ronniegarrison. What Are the Best Three Great Lakes Area Smallmouth Bass Fishing? 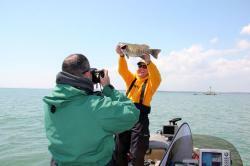 If you’re seeking a smallmouth worth photographing, now is the time to head to the Great Lakes. Great Lakes smallmouth bass provide some of the hottest bass action of the year during the fall. As their name implies, the challenge on these waters derives from their magnitude. Fish have plenty of room to roam from Duluth to the St. Lawrence River, and “roaming” is part of a smallmouth’s daily life. Here are three great Great Lakes fishing spots and how to catch them. “In fall, it’s all about bait,” says Frank Campbell, a guide with Niagara Region Charter Service. 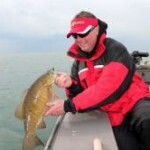 Campbell is considered by many to be the “dean” of an illustrious school of smallmouth guides on the Eastern Basin of Lake Erie and the Niagara River near Buffalo, New York. He says that smallmouth are looking for the quickest way to bulk up for winter and follow baitfish migrations and eat everything they find, from gobies to crayfish to sculpin to emerald shiners…anything that brings protein to their diet. “If you’re marking baitfish, you’re in the right areas because the fish will find them,” he said. The fall transition begins as water temperatures tumble into the low 60s. Campbell relies on his electronics to identify “balls of bait coming together…and lots of lasagne-type marks.” The baitfish concentrations position more and more near bottom as fall progresses. Smallmouth can be active and aggressive while they are bulking up for winter, and Campbell matches their mood with active presentations, often employing a jigging spoon — the Cotton Cordell C.C. Spoon — and the Heddon Sonar, a “tried and true” vibrating blade bait. Whopper smallmouth like this one are not hard to find in the cold, clear waters of the big lakes–but it takes a bit of know-how to get on the right spots. It’s a shallower bite for smallmouth in early to mid-fall on Lake St. Clair, home waters of Gerry Gostenik at Great Lakes Bass Fishing Guide Service. Smallmouth migrate toward the Canadian shore of St. Clair throughout the summer and concentrate near patches of vegetation on the flats. Lipless crankbaits can be critical search tools. The XCalibur Xr series comes in three sizes and in low resonance One Knocker (Xrk) options. Their weight and density enable long casts, which can be important on the often ultra-clear and expansive waters of the Great Lakes. A double-header of high-quality brown bass–expert guides say find the bait and you’ll find the bass. Gostenik starts with a steady retrieve, but often alters retrieve speed and cadence if a simple moderate retrieve fails to produce. And don’t overlook swimbaits, a more-subtle search bait option in the fall. Early fall finds smallmouth in transition in the picturesque waters of Lake Michigan and Green Bay in northern Door County, Wisconsin. Guide Jimmy Doering of Cast n’ Catch Charters guides anglers to bass near his Washington Island home and the waters of the upper peninsula, including Sister Bay, Ellison Bay and Rowleys Bay. His early season strategy is to straddle classic late summer and fall smallmouth locations. Deep running lures like the Sonar are among the favorites for connecting with fall smallmouth. Doering’s bread-and-butter baits in early fall are the Yum 2ube and slightly larger (4.25-inch) Yum Vibra-King Tube fished on 1/8- to ¼-ounce jigheads. Jighead size will vary with depth and wind velocity. He backs up that presentation with a wacky-rigged Yum Dinger. Fish school by size and age in fall, and an angler who finds schools of 3- or 4-pounders will do well to stay with these “wolf packs” whether he finds them shallow or deep. By late fall, bass settle into their classic cold water locations along the bluffs. These post card emblems of the Door County region are sheer rock walls that drop quickly to depths of 15-, 30- and even 40-plus feet. They can be late fall bass magnets, and they often yield the biggest fish of the season. “Up here we find certain key bluffs that the fish seem to live on,” says Doering. “We still see them spitting up gobies and crayfish, but a lot of bass are feeding on baitfish high in the water column. We catch them on and Smithwick Rogue jerkbaits only about 4-feet down along 30-foot-deep bluffs. This entry was posted in Bass Fishing, Where To Fish on September 25, 2013 by ronniegarrison. Its safe to assume that fishing guides are responsible for plenty of ‘my best fishing trip ever’ moments. It’s not a stretch, either, to assume that professional guide Dale Stroschein has personally hosted a few of those bests. But it’s quite different when that proclamation comes from another legend. Venerated fishing writer Robert Montgomery recently made such a public statement. 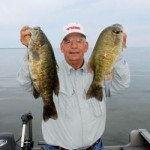 In his new book ‘Why We Fish,’ Montgomery dedicates a chapter to a fabled trip with Stroschein on Lake Michigan where they scooped dozens of smallmouth bass over five-clicks apiece. It stands as Montgomery’s best fishing trip ever. And now, the Freshwater Fishing Hall of Fame in Hayward, Wis., is recognizing Frabill prostaff Dale Stroschein’s greater contributions to fishing. Stroschein was born and raised on the same property where he and his wife Karyn now operate Sand Bay Beach Resort and Wacky Walleye Guide Service. His family purchased the resort in 1961; Stroschein took the reins in 1998. “It was always my parents’ dream for me to take over the resort,” says Stroschein. Today, based out of the resort, Stroschein guides some 300 trips a year, including ice and openwater. Rain or shine, he dedicates himself to catching fish. “I need to produce every day, whether it’s calm, rough, snowing or blowing. My customers expect that. My job is putting fish in the boat and on the ice.” Those fish species include walleyes and whitefish through the ice and walleyes and smallmouth bass on the open waves. Earlier in his ongoing 28-year guiding career, Stroschein gained recognition as a touring professional walleye angler. It began in 1985, competing in the Masters Walleye Circuit (MWC). Shooting pool at a bar owned by his friend’s sister, Stroschein would look out the window and see the mighty trucks and trailers piloted by contemporaries like Gary Parsons and Keith Kavajecz. He thought, “Maybe I can do that,” and that he did. Since 1985, Stroschein has racked up some pretty big numbers. He’s qualified 12 times for national championships in the MWC, Professional Walleye Trail (PWT) and Cabela’s NAWA, including six top ten finishes. From 1992-94, Stroschein held the PWT’s big fish record of 11.36 lbs., and claims a similar mark for his 10.56 lb. walleye caught at a Cabela’s NAWA event in 1994. Perhaps Stroschein’s most proud catch, however, was his record walleye taken through the ice. On March 21, 1995, he iced a 13.76 lb. walleye. For years, it stood as the largest ever caught by hook and line through the ice, as certified by the Freshwater Fishing Hall of Fame. “I reconsidered, and well, the rest is history. Since, Stroschein has given hundreds of seminars at fishing clubs, sport shows and retail engagements. Stroschein has also been a prominent contributor to outdoors publications, including In-Fisherman, North American Fisherman, Outdoor Life, Field & Stream, Sports Afield, Midwest Outdoors, Outdoor Notebook, Game & Fish Publications, even a piece on ice fishing published by mainstream Coastal Living. His television credits include In-Fisherman, Midwest Outdoors, John Gillespie’s Waters & Woods, The Next Bite, Bass Pro Shops programming, Ron Schara’s Minnesota Bound, Kent Hrbek Outdoors, Hank Parker’s Outdoor Magazine and North American Fisherman. This entry was posted in Walleye and Sauger on September 24, 2013 by ronniegarrison. How Can I Catch Fall Georgia Largemouth? October is an outstanding month to fish for bass in Georgia. The air has a crisp coolness not felt since early last spring, the leaves are turning beautiful colors, the water is nice and clear and it is a joy to be outdoors. But best of all Georgia largemouth are on a feeding rampage and you can catch them in lots of different ways. Cooling water in Georgia lakes in October makes bass become more active for several reasons. It stimulates both male and female bass to feed up and store fat reserves for the coming cold months. Female bass have the added need to feed because of developing eggs that must be mature as soon as the water warms next spring. And the food bass eat is more active in cooler water. As the water cools on big lakes the shad begin to migrate into the creeks and more shallow arms of the lake, drawing bass with them. Bream become more active, feeding up for winter and the bass take advantage of this activity. And one of their most favorite foods, crayfish, are at the peak of their numbers and are also feeding and getting ready for winter. Any bait you like to throw will catch bass in the fall. Since bass are so active, a fast moving bait that covers a lot of water will help you find them and catch them. Once you locate schools of bass you can change baits and keep catching them in different ways. And the bass will fight hard in the cooler water no matter what they hit. Crankbaits are an excellent bait in October. Since the shad and other baitfish are active you can fish them fast and use them as a search bait. A variety of colors work well in different situations this time of year. Shad colored crankbaits are excellent around open water structure like points, humps and drops. Crawfish colors are good on clay banks and around rocks. And bream colored crankbaits work well around brush, blowdowns and weeds where bream hide. Spinnerbaits are a good choice to cover water and catch quality fish, and bass hooked on spinnerbaits tend to stay buttoned up better then they do on crankbaits. Use white spinnerbaits with silver blades in clear water or white and chartreuse skirted baits with gold and silver combinations blades if the water has some stain to it. Fish spinnerbaits around shallow cover like blowdowns, brush and grass in the water, but don’t hesitate to throw them on rocky or clay banks, too. Start by running them just under the surface for the most active bass but also slow roll them down deeper if the bass are not coming to the top to hit. Topwater baits are the most fun baits to fish and bass eat them readily this time of year. Buzzbaits are great and bass will often explode on one run across shallow cover. White buzzbaits with silver blades in 3/8ths to 1/2 ounce sizes are excellent since bass are feeding on bigger baitfish and like a big meal. 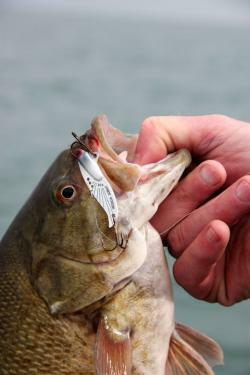 Poppers can be fished slowly and will draw bass from many feet away, and bass will often come completely out of the water when they hit them. But be ready for a gentle bite when the bait just disappears without a ripple. That might be the biggest bass of the day. Try silver bottom baits and remember that bass see the bait from the bottom when choosing one. Fish all topwater over any cover you can find, but don’t hesitate to throw them over open water, too. 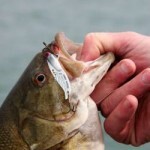 Bass will often come up from several feet down to hit topwater on points and off drops. Bass often suspend this time of year in open water and will come up for a topwater bait, so throw them anywhere you see baitfish activity in open water, too. If you want to concentrate on big bass, a jig and pig is hard to beat. Bass love crayfish and this bait imitates that slow moving feast. Brown colors in clear water and black with blue or chartreuse in stained water are the usual choices, and they should be fished slowly around all kinds of cover. Crayfish like to burrow into clay banks to survive the winter, so concentrate on those areas with a jig and pig. They also like rocks, so riprap and rocky banks are another good place to fish them. Crawl your jig and pig along the bottom then make it hop, imitating a crayfish feeding along then jumping away when frightened. Structure and cover to concentrate on this time of year includes rocky and clay points, rock and clay banks, wood cover like brushpiles, stumps and blowdowns and any kind of grass from hydrilla to water willow. Fish them all until you find what the bass are holding on that day and you can usually duplicate it on other areas of the lake. The following lakes all offer great bass fishing in October. Pick one near you and give it a try. Located just off I-75 between Macon and Atlanta north of Forsyth, High Falls is a 660 acre lake in a state park. There are two boat ramps, one at the dam and another in Buck Creek, but motors are limited to 10 horsepower or less. You can put in a bass boat with a bigger motor as long as you don’t crank it, using only your trolling motor. State creel limits of 10 bass per day a minimum of 12 inches long apply at High Falls. You are not allowed to fish at night, you can fish from 30 minutes before sunrise to 30 minutes after sunset. High Falls is known locally for its big bass, and it has a good population of bass in different year classes. Drop by Berry’s Sporting Goods in Griffin on your way to the lake and admire the 11 pound, 4 ounce bass hanging on the wall for an example of why it has that reputation. Jim caught it at High Falls a few years ago and you can probably pick up some current tips for bass fishing there. Since High Falls is one of the oldest lakes in Georgia, most of the channels have been silted in over the years. It is ringed by docks and many of them have brush piles. Backs of creeks like Buck Creek, Watkins Bottom and Brushy Creek are filled with stumps, many with bushes growing on them. There are also numerous blowdowns along the bank. You can fish points at the mouths of the major creeks and wood cover on most areas of the lake. Rocks are hard to find but there are a few, especially in the river above the area where Buck Creek enters. Plan on fishing slowly and working all cover carefully since the motor limit will probably keep you from running all over the lake, anyway. Juliette is about 15 miles east of I-75 and Forsyth, Georgia. This Georgia Power lake was built for cooling the steam plant there and its 3600 acres are surrounded by a wildlife management area, so the only development is the power plant and two parks with boat ramps. Motors are limited to 25 horsepower and you can use a bass boat with a bigger motor if you don’t crank it, but you will be very limited on a lake this size. You can keep 10 bass a day at Juliette and there is no minimum size. There are no restrictions on times you can fish Juliette and a campground allows you to stay and fish at night if you like. Juliette produces excellent numbers of big bass but can be difficult to fish. 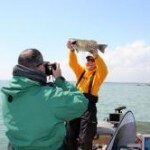 A monthly tournament there usually has several six pound plus bass weighed in, and it often takes five weighing over 15 pounds to win. The lake is not very fertile and that is why there are no size limits on bass. The water at Juliette is extremely clear and water weeds grow from the shallows to 20 feet deep or more in some areas of the lake. Water for Juliette is pumped in from the Ocmulgee River and there is very little inflow from runoff, hence the clear water and low fertility. Standing trees were left all over the lake when it was filled. The lower lake is covered with trees under the water and the upper lake is almost solid trees above the water. The grass and trees are the key to Juliette. Locate some of the numerous humps and channels with trees or grass on them and you can catch bass on crankbaits. Use big baits and make long casts in the clear water. Spinnerbaits also work well when fished over the tops of the grass from shallow to deep. Topwater baits are also excellent over and around the grass. Tobesofkee is one of our most urban lakes. Located just west of Macon, it’s 1750 acres of water get very crowded on nice days. There are two parks with ramps run by Bibb County and it is expensive to launch in them, with a cost of about $9 per trip. There are no motor restrictions and you will encounter many ski boats and skidoos. State creel limits of 10 bass at least 12 inches long apply at Tobesofkee. Night fishing is often good since most of the pleasure boats are off the water after dark. The many lighted boat docks offer bass attractions after dark as well as during the day. There are good numbers of keeper bass in Tobesofkee and four pound bass are fairly common. A night tournament during the summer, switching to a morning weekend tournament after the weather cools, often produces five bass weighing 15 to 20 pounds for the winner. In addition to the docks, the lower lake has several bridges with riprap to fish. Long points have rocks on some and brush on others. The upper lake is less developed and you can fish points and drops on it, as well as a few docks and some grassbeds. Goat Rock is a river with dams at both ends. Located just north of Columbus, this old lake on the Chattahoochee River has 940 acres of water to fish. There is one small ramp near the dam on the Georgia side of the lake and another public ramp on the upper end on the Alabama side but access is not good. You can launch a bass boat there and there are no motor restrictions. State creel limits and length limits of 10 bass a minimum of 12 inches long each day apply, and you can use either a Georgia or Alabama fishing license. You can fish at night but this lake can be dangerous with unmarked shallows, so be very careful. Since it is not developed, there will be no lights on docks to help you see. The population of largemouth is good at Goat Rock and some big fish are caught there each year. You can fish the rocky shoreline of the old river channel and the humps and stump fields in it. There are a good many blowdowns along the steep banks to fish. A couple of small creeks enter and the mouths of them can be good in the fall. Current plays a big part in the activity of bass at Goat Rock. Bartlett’s Ferry dam is located on the upstream end of the lake, and any time power is being generated there is a good current all through the lake. This makes the largemouth move to cover that breaks the current and they feed there, so use a crankbait or spinnerbait moving with the current past ambush points to catch them. Banks Lake is part of a National Wildlife Refuge located just west of Lakeland, about 20 miles north of Valdosta. This lake is actually a Carolina Bay, a natural depression found in south Georgia, with a dam to make it bigger and deeper. There are about 1000 acres of open water to fish but it is surrounded by 1500 acres of marsh and another 1500 acres of cypress swamp. State creel and size limits apply and there is a free public boat ramp. Although no motor restrictions apply on Banks Lake, its average depth of 5 feet and numerous stumps and logs means you must be very careful in a big boat. The Refuge folks recommend idle speed only. During the summer Banks Lake is hard to fish because of all the weeds in the water, but by October they are starting to die back and you can find open water to fish. The whole lake looks “fishy” and its waters are full of big largemouth. This is a good place to catch a personal record largemouth. Fish spinnerbaits over the grass and drop a jig and pig into holes in it. You can find some deeper holes in the open water, up to 15 feet deep, and the bass often hold in the grass around them. Also try pitching a jig and pig to the base of cypress trees. A good tactic is to let it hit the tree trunk and drop straight down into the root ball. You will need heavy tackle for fishing Banks Lake. Fort Stewart Army Base near Richmond Hill just west of I-95 has about 20 ponds on it that are open to public fishing. They total about 500 acres although not all are open all the time. You can use a boat in all of them but not all ponds have boat ramps. The creel and length limits vary for different ponds and can change. Generally there is a 15 inch limit on largemouth but some ponds, like #26, Big Metz, is managed for trophy largemouth and has a 24 inch minimum length. A bass that size will weigh between 8 and 10 pounds! You must check in and get a daily permit to fish, so check current regulations when you go. Fort Stewart is known for its big largemouth. Since 1992, six of the top 30 largemouth taken in Georgia came from Fort Stewart. All ponds have them and your chance of catching a wall hanger are good. Some ponds are managed for trophy largemouth so concentrate on them if that is your goal. The ponds at Fort Stewart vary a lot but all of them are full of grass. Fish spinnerbaits and topwater plugs over and around this grass. Pitch a jig and pig into holes in the grass, especially near the deeper water in the pond, for big bass. Use heavy tackle, when a lunker goes into the grass you need heavy rods and strong line to get them out. All of these waters offer great October fishing in Georgia. All you have to do is decide where to head this month to take advantage of the good fishing. This entry was posted in Bass Fishing, How To Fish, Where To Fish on September 23, 2013 by ronniegarrison. 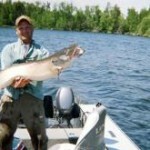 How Can I Catch Fall Muskie? Muskies are fabled as fish of 1,000 casts, but fall is a great time to cut that imposing figure down to size. In fact, anglers keying on high-percentage hotspots with the right tactics can enjoy the best muskie fishing of the year. Whopper muskies like this one don’t necessarily take 1,000 casts to catch, but they do take the sort of expertise offered by top guides like Bill Rosner. Veteran muskie guide Bill Rosner might not be a math whiz, but he’s an expert at subtracting sizeable sums from the mythical 1,000-cast mark. He follows environmental clues to craft a milk run of prime locations where he can consistently put clients on toothsome trophies, then deploys proven presentations to tempt these freshwater monsters into striking. As the water temperature begins to drop in September, however, some of the more fragile varieties of aquatic vegetation start to wither away, pushing muskies to the last remaining stands of greens. On Vermillion, that’s cabbage beds. Also known as broad-leafed pondweed, cabbage is hearty, often remaining healthy long after other plants have expired. Its leafy stalks offer shelter for a number of forage species, which also flock to the season’s last stands. The abundance of forage does not go unnoticed by a lake’s predatory population-including behemoth muskies. On Vermillion, Rosner typically targets beds in 6 to 12 feet of water, though he notes that the depth of vegetation varies from lake to lake depending on water quality. In clear lakes it’s not uncommon for cabbage to take root in depths of 20 feet. Other top late-season greenery includes northern milfoil, but the important thing is finding the best remaining weedbeds after other stands have fallen. 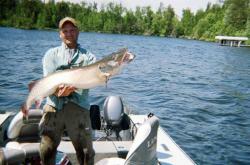 The Lindy Muskie Tandem is among the prime lures for giant muskies in September. Rosner raids these fish-holding sunken gardens by slinging blades-specifically, a Lindy M/G Muskie Tandem. The 1-ounce, 9½-inch double-bladed spinnerbait sports size 5 and size 8 Colorado blades that churn and flash, attracting hungry muskies and triggering strikes the likes of which are hard to match in freshwater. Color selection is simple. He sometimes throws a ½-ounce spinnerbait like Booyah’s Pikee with a soft-plastic trailer, either the YUM Boogee Tail or Houdini Shad. His standard tackle for taking on giant muskies consists of an 8-foot, medium-heavy casting rod loaded with 80-pound-test superbraid and a 130-pound test, 12-inch fluorocarbon leader. Casts are long, and retrieves varied. “Cast and burn it along weedlines, then slow down and let the bait helicopter, then pull it back to break the surface-in other words, experiment with speed and cadence,” he says. As good as green weeds can be, Rosner notes that a percentage of muskies also patrol rocky structure during early to mid-fall. Some top spots include bottlenecks between islands and channels connecting lakes or basins. The latter areas are often brushed with current and serve as underwater highways that muskies and baitfish follow as they jockey positions before winter’s arrival. Trolling gets the nod in such areas, which may lie in 20 to 25 feet of water. Rosner relies on large, deep-diving crankbaits such as a CD25 from Bomber Saltwater Grade’s Certified Depth lineup. Tackle choices remain similar, though he may bump up leader length to 36 inches. 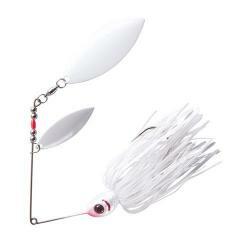 Also effective is the Booyah Pikee minnow fished around the last remaining weedbeds as winter approaches. Trolling speeds run from 3 to 4 mph, which is fast enough to cover water and trigger strikes without zipping past predators too quickly. To speed the search for fish, Rosner often cruises likely areas before deploying his lines, watching his sonar for signs of baitfish and muskies. Toward the end of October-around Oct. 20 on Lake Vermillion-another deadly pattern takes shape that is tied to baitfish spawning migrations. To join the fray, Rosner trolls big crankbaits such as an 11-inch Creek Chub Jointed Wooden Pikie. His top color choices in tannin-stained Lake Vermillion include Pikie and Perch, but he notes that in clear lakes, a black-backed, purple pattern that mimics the iridescent flashes of rolling baitfish is also hot. “I longline baits behind the boat, banging the rocks at speeds of about 3½ mph,” he says. Since these shallow-running lures typically only reach 4 feet on the troll, he adds 1- to 4-ounces of ballast in the form of a bead-chain keel sinker to pull the plugs down to the strike zone. The key is to tailor the amount of weight to keep the bait close to bottom without constantly dragging. Properly weighted, the same spinnerbaits that slayed ‘skis in salad back in September also work for tapping the late-October bite. In fact, blades have accounted some of Rosner’s best fall catches in a variety of situations, and are always worth a shot whenever you hope to trim the time between strikes from these incredible freshwater monsters. This entry was posted in Fishing Tackle on September 22, 2013 by ronniegarrison. What Are Some Georgia Rivers I Can Fish For Bass? When Georgia bass anglers get together and talk fishing, it is almost always about lakes and reservoirs. That is a little strange since the world record largemouth bass came from an oxbow on a Georgia river. Georgia has many rivers that are full of bass. boats and canoes. No matter what your choice, new ramps on many of our rivers have opened them up to the fisherman. You can put in at one ramp and fish downstream to the next one or fish out of a specific ramp like you do on a lake. No matter what river you chose to fish, bass are somewhat different critters in flowing water. Each river has specifics that work best on them so it is a good idea to get some tips in advance. Your lake and pond fishing methods will catch some bass, but it is best to adapt to what the fish want. The following three rivers will give you a variety of places to try, and the tips will work on them and on other rivers you fish. The upper Savannah has been dammed and is flat water from the Clark’s Hill dam to its upper end in Lake Hartwell where the Seneca and Tugalo join to form it. There is also an old lock and dam in Augusta but downstream of it the river is free flowing. You can fish it for largemouth bass from Augusta all the way to the coast where it becomes brackish. There are several good ramps along the river you can use. The Georgia Department of Natural Resources maintains five ramps on the river and there are also several commercial ramps. There are a few ramps on the South Carolina side maintained by that state as well as private ramps. The DNR ramps are Tuckassee King in Effingham County, Yuchi WMA in Burke County, Tuckahoe WMA in Screven County, Burton’s Ferry in Screven County and Poor Robins Landing in Screven County. All these are good paved ramps and there is no fee to launch at them. You can fish all the river and most of the oxbow lakes with a Georgia license, but some oxbows are totally in South Carolina and you need a license from that state to fish them. Get a USGS topo map to identify them. This map will also help you find some good spots to fish. The release of water at Clark’s Hill affects the river for many miles below Augusta. When the river is running high from the release of water bass can get back in the woods and are almost impossible to get to. You can check the USGS river gauge at Clyo and Georgia DNR folks say the fishing is best when the gauge is at 5 to 6 feet. Down the river near the coast the water will not change as much from the release of water, since the river is much bigger. On the far end of the river near the coast tides affect it, and you can time your bass fishing based on the rise and fall of water from it. Bass fishing has been excellent during the past two years due to high river levels that gave bass access to a lot of new ground and food after our drought. Catch rates were up 14 percent in 2003 and the bass were larger. The Georgia Bass Chapter Federation Tournament Results compiled by Dr. Carl Quertermus at the University of West Georgia can give you a good idea about the bass fishing on a body of water. Each bass club in Georgia sends in their creel census after a tournament and the results are studied and listed. In 2003, the last year results are available right now, there were 28 club tournaments on the Savannah River that included 2623 hours of fishing by anglers in the clubs. An average of .195 bass per hour were weighed in, meaning it took just over 5 hours of fishing to land a legal bass. That compares to .214 bass per hour on all Georgia waters, so the Savannah River is about as good as any lake. The bass weighed an average of 1.48 pounds and it took an average weight of 6.33 pounds to win a tournament. In club tournaments, 12 percent of fishermen weighed in a five fish limit and 35.5 percent did not catch a keeper. So fishing can be tough, but in all Georgia waters only 13.8 percent of club fishermen had a limit and 26.9 percent zeroed. Fishing the Savannah River compares favorably with most lakes. Robert Ellis fishes with the Four River Bassmasters bass club in Vidalia and they fish the Savannah River in club tournaments. Robert made the state team last year by finishing 11th at Lake Eufaula in the Top Six and then was top man on the state team in the Southern Regional in Kentucky, which means he was the only Georgia club fishermen to qualify for the Nationals this year. The Savannah River is a beautiful place to fish and Robert likes it from its upper reaches all the way to tidewater. He says the best fishing for him is upstream and the tide makes the fishing tough on the lower river, but his club catches bass all along it. In the spring, bass move out of the main river into the old sloughs and oxbow lakes to spawn. This happens as soon as the water starts to warm, which usually coincides with the rising spring waters. This time of year Robert especially likes the oxbows above the Highway 301 bridge. Go into these oxbows and you will find the outside bend a little deeper with the inside bend more shallow. Willow trees line the shallow bank and the deeper banks often have stumps and blowdowns on them to fish. You can often follow these oxbows and small creeks for a long way off the river. Robert likes to start out with a buzzbait looking for active bass in these areas if the water is above 55 degrees. A Trick Worm in white or sweet potato colors fished under the willows or around the wood cover is his next choice, then a Suddeth Little Earl fished in the same places. Follow these up with a Texas rigged worm in black/red flake and you should find what the bass want. The bass will stay in these areas until the water gets hot, then most will move back to the main river channel. Some bass can be found in the oxbows all year long, especially the deeper ones, but for more bass move out to the current during the summer. If the river is muddy Robert will throw a chartreuse spinnerbait with big blades or a chartreuse crankbait around anything in the river that breaks the current. If it is stained to clear he will use the same baits as he used in the oxbows. The mouths of creeks and ditches are good as are trees and stumps in the water. Pilings should be fished just like stumps. Also watch for riprap banks. Some stretches of the river have long sections of rocks placed there to stop erosion. Fish these rocks year round with crankbaits and spinnerbaits. To fish the current, Robert heads his boat upstream and lets it drift slowly back down the river, keeping it in position and moving slowly with the current with his trolling motor. He likes to cast upstream and let his baits move back downstream naturally with the current. A strong trolling motor is needed for this kind of fishing. Don’t hesitate to throw a buzzbait all day long on the shady side of the river. In one tournament Bob and his partner landed a 8.77 pound largemouth at 2:30 PM on a buzzbait by fishing the shade. The Ogeechee River starts near I-20 about 40 miles east of Lake Oconee and flows south east to hit tidewater near I-95 south of Savannah. It is free flowing over almost all its length, with one small grist mill dam near its upper end. The rest of the river responds to natural rainfall, not release of water from dams. There are shoals on the upper river making boat fishing difficult. Where highway 16 crosses the river at Jewell you can see some of the shoals and it looks more like a trout stream. Just south of there the river is suitable for fishing with a jon boat or canoe for several miles but is full of blowdown trees the often block the river completely. When the river gets to Louisville it broadens to 35 to 50 feet wide and you can use bigger boats, but small bass boats and jon boats are still better then bigger boats. Below Millen the river widens and has big swamps and oxbow lakes on it. There are four DNR ramps on the Ogeechee River and are kept in good condition and are free. The Morgan’s Bridge ramp is in Bryan County. The Highway 1 ramp is in Jefferson County as is the Highway 88 and the Highway 78 ramp. The smaller river is not known for its bass fishing and there were no tournaments reported on it. Less then three percent of the creel of anglers fishing the river are largemouth, according to the DNR. But the largemouth population is good and the fish are healthy, they just don’t receive much pressure. The DNR reported over 23 largemouth per hour of electrofishing while doing their annual survey, an unusually high number. Since there are no dams upstream to affect river flow, rains can change it fairly fast. When the river is high the bass move out into newly flooded ground to feed. Find a ditch or oxbow and go out in it, following the bass to the very shallow newly flooded water. Trick worms, spinnerbaits and topwater baits are all good. When the water is lower and the river within its banks, fish anything in the current that provides and eddy for bass to wait in for food. The swirl of water behind a stump or the trunk of a blowdown is an excellent place to find a bass waiting on a meal. Run a topwater plug or buzzbait over these eddies when the water is warm. Also let a Texas rigged worm float with the current into such hiding places. Use a light lead that will give you some control of the worm but that will not take it straight to the bottom. The Altamaha is one of our biggest rivers although it is fairly short. Formed by the joining of the Oconee and Ocmulgee Rivers just north of highway 221 north of Hazlehurst, it flows to the tidewater near Darien. Bass fishing is good along its whole length. There are ten DNR ramps on the Altamaha and all are free. Most are kept in good condition. They are Williamsburg Landing in Wayne County, Morris Landing in Appling County, Carter Bight in Appling County, Town Bluff in Jeff Davis County, McNatt Falls in Toombs County, U.S. Highway 1 Ramp in Toombs County, Upper Wayne County Ramp in Wayne County, Pig Farm Landing in Wayne County and Highway 135 Landing in Montegomery County. DNR sampling shows the largemouth population in the Altamaha has increased during the past couple of years, but the most noticeable change was the condition of the bass. They had fattened up a lot after the drought ended. High spring waters the past couple of years has made a lot more food available to them. There are a lot of 12 to 14 inch bass in the river according to the DNR. Tournament results reflect this. 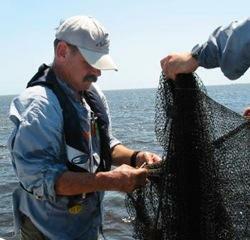 There were 27 reported tournament there in 2003 that had a total of 2722 fisherman hours. The catch rate was .245 bass per hour, about one keeper every four hours, and the average weight was 1.57 pounds. It took 7.01 pounds to win an average tournament and 23.8 percent of anglers had a five fish limit, a very high percentage. Even with that,, 36 percent of club fishermen did not weigh in a keeper bass, so it is tough if you don’t know the river. Ray Odum, Jr. fishes with the Satilla Bass Anglers out of Douglas and that club fishes the Altamaha River a lot. He also fishes several buddy and pot trails on the river and it is one of his favorite places to fish. He does well in tournaments there in his club and in other tournaments. The river level impacts the fishing a lot here, too. Ray likes to get back in the oxbows during the spring and also during high water levels. He will try to find the ditch or channel in the oxbow or creek entering the river and follow it. He says bass will move out into the very shallow flooded areas to feed but will hold on the lip of the ditch. Fish a spinnerbait out on the flat shallow water and let if fall as it gets to the lip of the ditch. Also pitch a Texas rigged craw to the base of trees, especially those close to the channel. Ray likes a black craw with green flake. Fish all the cover carefully. Out on the main river Ray likes to fish upstream against the current. He has a powerful trolling motor on his boat and he fishes upstream, allowing him more time to cast. Make cast upstream and work your bait back with the current, offering the bass a natural look. A good spot to try when the river is at normal stage is the back sides of sandbars. Ray says there are usually steps of ledges on the back sides of them, and he will position his boat so he can cast up to the shallow water on top of the sandbar and work it back. A deep diving crankbait is his first choice followed by a Texas rigged worm. On the lower end of the river where the tide affects it, Ray likes to follow the dropping water upstream. He will stop at each ditch where water is flowing out of the swamps and marshes and fish the downstream side of this current. He says he may make only 8 to 10 casts on a spot before heading upstream to the next one, keeping up with the dropping tide as it moves upstream. These three rivers are similar in a lot of ways but each has its own characteristics. Plan a trip to one of them, or all three this year for some good bass fishing. A river guide that contains a map, access sites and fishing tips is available for the Altamaha and Ogeechee Rivers from the Georgia DNR. You can call the Wildlife Resources Division, Fisheries Management Office at 770-918-6400 or contact your local fisheries management office. This entry was posted in Bass Fishing, River Fishing on September 21, 2013 by ronniegarrison.